The Emma 42 inch vanity embraces purity of design and masterful construction. The vanity in Dove Gray finish paired with brushed nickel hardware brings to life the cabinet's simple, clean lines. Emma provides abundant storage and Zen-like functionality. Soft-close glides and hinges keep things quiet and the solid wood frame and dovetail joints keep things strong. The collection also features complementary mirror and linen tower to expand the look. Emma makes your bathroom beautiful. The Allie 30 inch vanity brings to you good looks and generous storage. An uncomplicated design scheme gains luster from the sophisticated Twilight Gray finish with matte gold trim and hardware. A solid birch wood frame, plywood drawer boxes, dovetail joints, a convenient toe kick, and soft-close glides and hinges testify to the quality of construction. A large open shelf provides ample storage. Complete the look with matching mirror, mirror cabinet, and linen tower. Allie is all you need to make your bathroom amazing. The Allie 31 inch vanity combo brings to you good looks and generous storage. An uncomplicated design scheme gains luster from the sophisticated Twilight Gray finish with matte gold trim and hardware. A solid birch wood frame, plywood drawer boxes, dovetail joints, a convenient toe kick, and soft-close glides and hinges testify to the quality of construction. The vanity combo includes a white quartz top and retangular undermount sink. A large open shelf provides ample storage. The Austen 72 inch vanity is simple yet stunning. The Austen Collection features a minimalist design that pops with colour thanks to the refined Twilight Gray finish with matte gold trim and hardware. The cabinet features a solid wood birch frame, plywood drawer boxes, dovetail joints, a toe kick for convenience, and soft-close glides and hinges. Complete the look with matching mirror, mirror cabinet, and linen tower. A perfect choice for the modern bathroom, Austen feels at home in multiple design settings. If you want a vanity that is both stylish and useful, this classic vanity is perfect. Its beautiful beige tan marble counter and brown solid wood base bring a great new look into your bathroom. Its double-door cabinet and drawers have lots of room to keep all of your bathroom items. Add a classic feel to your bathroom with this simple vanity set from Avanity. 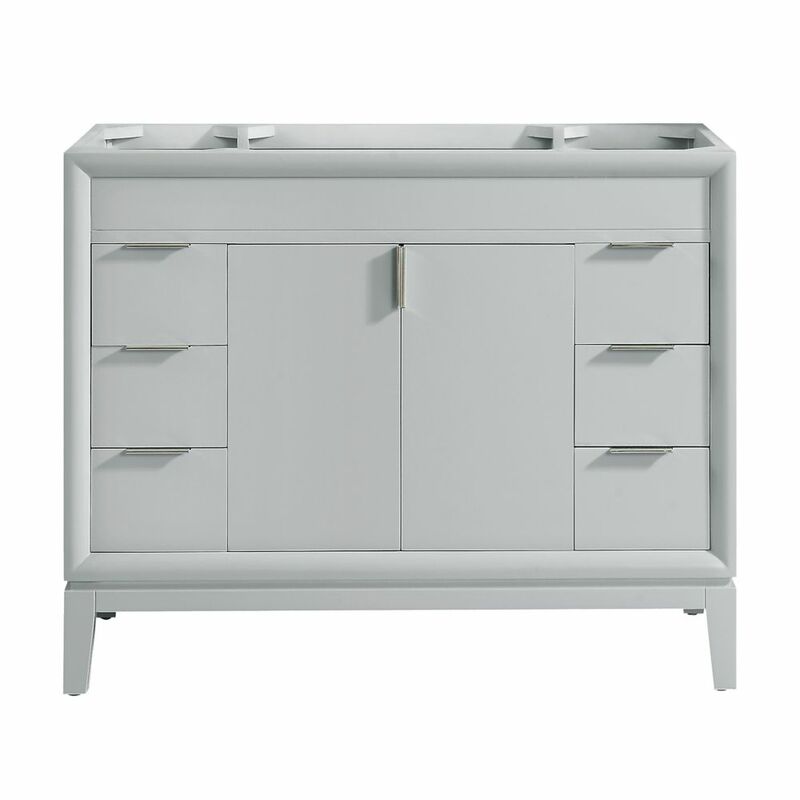 Emma 42 inch Vanity Only in Dove Gray The Emma 42 inch vanity embraces purity of design and masterful construction. The vanity in Dove Gray finish paired with brushed nickel hardware brings to life the cabinet's simple, clean lines. Emma provides abundant storage and Zen-like functionality. Soft-close glides and hinges keep things quiet and the solid wood frame and dovetail joints keep things strong. The collection also features complementary mirror and linen tower to expand the look. Emma makes your bathroom beautiful.